We started our school year with Form Drawing and then moved into our first Old Testament Block. The Old Testament Block is one that many folks struggle with due to their own experiences with religion. Please remember, these are stories of a people and that people’s relationship to authority; they are also the stories of a people trying to make a home for themselves on earth. These issues speak clearly to a nine-year old who is grappling with these ideas if only subconsciously. These stories are not dealt with from a religious perspective within the Waldorf curriculum, although of course one is free to do this at home if one is Christian or Jewish. I am Christian and tend to look at these stories from that viewpoint. I highly suggest you obtain a copy of the Christopherus Homeschool Resources’ Old Testament Manual and Stories: http://www.christopherushomeschool.org/bookstore-for-waldorf-homeschooling/publications-for-grades-1-through-5/old-testament-stories-3rd-grade-curriculum.html I think that the Christopherus notes to approaching these stories is helpful. The other source that helped me approach this block was the Christian resource “Genesis: Finding Our Roots” by Ruth Beechick. We looked at what was present before Creation occurred and how the singing of the stars accompanied Creation (another quote for the Main Lesson book – see Job 38:7). We also looked at the beginning of the Book of John, of which many of you are familiar, that talks about what was present from the beginning of time. We started with these quotes in print and moved into cursive writing later in this block. So then we were ready to start talking about the first story in the book of Genesis, the story of Creation. 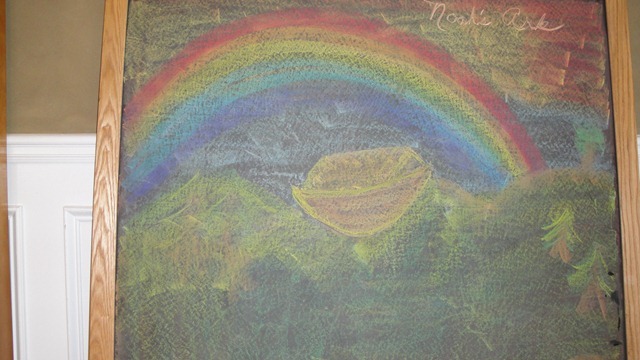 We wet –on- wet watercolor painted the 7 Days of Creation. My main resource for the painting inspiration came from the Christopherus Third Grade Curriculum. We looked at God creating man in His own image, I had my Third Grader write in her Main Lesson Book “God created human beings in His image” (Genesis 1:27). I pulled spelling words from the story of Creation. 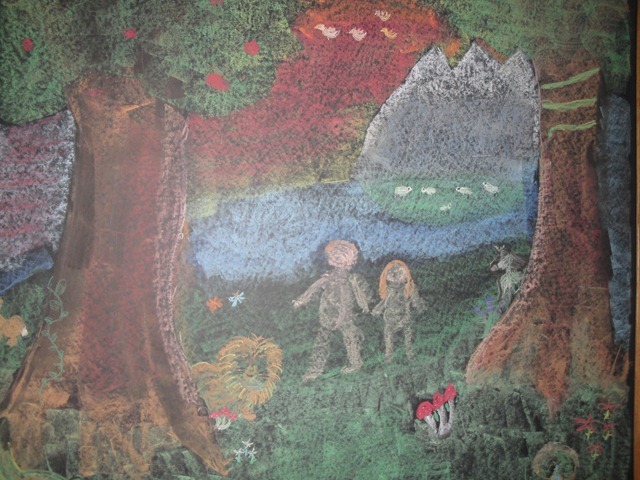 We then moved into the story of Adam and Eve, The Garden Of Eden and the Fall. I used the animals and plants inhabiting the Garden of Eden as a way to start forming sentences with a subject and a predicate (subjects in blue and predicates in red). I have mentioned before that we have done a little more grammar than is typical of this point in the Waldorf curriculum due to the fact that my Third Grader is also in German School on Saturdays and was getting the grammar between German and English rather mixed-up. The story of The Fall and of Cain and Abel can be very challenging ones! 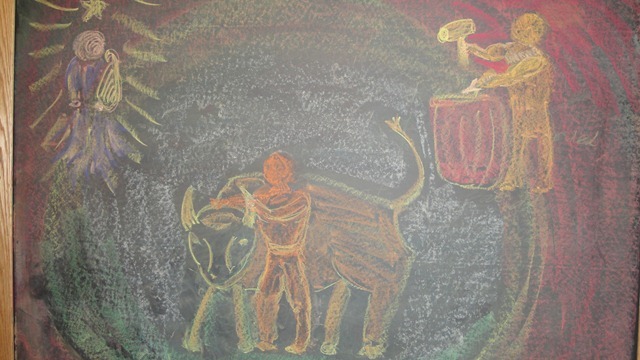 We found the language to use for the summary of Cain and Abel to be challenging and we consulted several different renditions of this story – the Bible, Ruth Beechick’s “Adam and His Kin” and Jakcob Streit’s “And Then There Was Light”. My daughter’s narration of The Fall ended up being this: “Adam and Eve ate from the Tree of Knowledge. They were driven out of the Garden of Eden. On earth they had to make clothes, build a shelter and gather food.” It is very important to really go through this process on the board and not rush trying to obtain a summary. After this we traced the descendents of Cain and Seth and my daughter drew these family trees in her Main Lesson book. This idea came to me through Christian author and homeschooling consultant Ruth Beechick’s book “”Adam and His Kin”. This lineage will become important later as we trace the lineage leading to Abraham (and in our faith, leading to Jesus) in our second Old Testament block. We talked about the sons of Lamech (a descendent of Cain): Jabal, Jubal and Tubal Cain and their contributions to civilization. For these stories I used a combination of what is in the Bible and what Ruth Beechick fleshed out of the sparse lines in the Book of Genesis in story form in “Adam and His Kin”. I also found the section of these stories in his book mentioned above to be helpful. We used the animals of the Ark as a springboard to talk about naming words, doing words, how words and picture words and made many sentences with pictures. We ended this block with the story of what happened to Noah after the ark came to rest and how Noah’s descendents populated the earth. We will pick up our next block with the story of The Tower of Babel. The Christopherus Old Testament Manual and Stories – the background information in there, the full-color reproductions of the seven days of creation and other ideas for working with this block are helpful. Also, the music section of the complete Christopherus Third Grade syllabus had helpful music and poetry suggestions to go along with this block, including an intriguing poem about Tubal Cain. Jakob Streit’s “And Then There Was Light.” Some may find this esoteric companion to be quite startling, but I found much of it matched up to Ruth Beechick’s book quite well because both incorporate what is said in the Bible and what was said in Hebrew legends surrounding these events and fleshes the Biblical events out in a story format. Arthur Auer’s “Modeling: Sculptural Ideas for For School and Home” had excellent suggestions for modeling for Noah’s Ark, and the animals of the Ark and the Garden of Eden. One resource I do not have but would really like to get for when I do this block again is this one: http://www.amazon.com/Legends-Bible-Louis-Ginzberg/dp/0827604041/ref=sr_1_1?ie=UTF8&qid=1288451554&sr=8-1 I believe Eva over at Untrodden Paths mentioned this on her blog and it was the first place I had heard about it. Thank you Eva. The challenging areas about this block outside of the themes and stories themselves included the drawing – moving into drawing animals and the importance of gesture and color in these drawings; what spelling words to really pull from these stories (too hard? too easy? ); and being able to really pull in the music, painting, modeling, poetry in conjunction with all the grammar and spelling and introductory cursive writing. Again, I enjoyed working grammar in with these stories for my child but not every child will be ready for that. The other interesting aspect of this block for me personally was seeing my nine-year-old’s work. It was, to be frank, rushed and sloppy. Some of this was no doubt due to me having to stand up and hold and dance around with a baby and tend to a kindergartner and not being able to always sit right there and draw each step by step, but some of this was also due to where my nine-year-old was. She did not want to rush, she told me, but she wanted to “get through the stories and drawings.” (She told me this after the block was over, and you can see the logic of a nine-year old right there, bless her heart). I felt we did a lot of “active” in this block, singing and stamping and poetry and modeling and painting and drawing, so I do think some of that is just indicative of where she is developmentally right now. This is the blessing of being able to work with our children at home and meet them where they are. Hope that this post will be helpful to some of you as you plan. this will be really helpful as i plan for next year. thank you! i’m guessing i will be telling these stories to my younger one as well – he will be 5. do you think there is any concern in telling these stories to a younger child even though they are designed for the 9 year olds? No, I believe these stories will go over your five year old’s head for the most part and then will meet him when it is his term later. For the most part this is true for all of the things within the curriculum. so love your blogging on this block! I am a born-again Christian and want to use the Waldorf/Christopherus curriculum but am concerned about the lack of spiritual focus on the Bible (as with many other “Christian” curriculums that simply add a “Bible course” to a generic curriculum). You and I are singing the same song. I have a true issue with Christian curriculums that just think slapping a Bible verse onto something makes it Christian! Ugh! I think you can tailor your homeschool to focus on what you deem most important — Waldorf will actually fit very well into that since it has a focus on the child as a spiritual being and on love and forgiveness and compassion at its core. Thank you so much for the resources. It gives me much to think about. I feel like I’ve just finally gotten a handle on the fairytales as we are about to switch to saints. I think I’ll familiarize myself early, especially since I did not grow up in a religious home and dont have a firm handle on the stories myself. Also, thank you for mentioning your daughters work. I also am sometimes juggling the others and feel I wish I could sit and do more with her. She does such lovely work when she is attentive, some times I’ll hop up for a minute and come back to a quick finish. Its just nice to hear the same thing happening in other homes. This is a very helpful post, thank you!